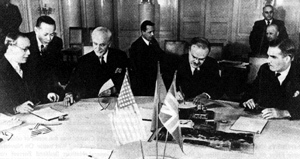 Cordell Hull, U. S. Secretary of State, signing the Moscow Pact, 1943. Seated, left to right, are Fu Ping-Sheung, China's Ambassador to the USSR, Hull, Vyacheslav Molotov, USSR Commisar of Foreign Affairs, and Sir Anthony Eden, the United Kingdom's Secretary for Foreign Affairs. Disclaimer National Archives and Records Administration. Photograph by ACME.